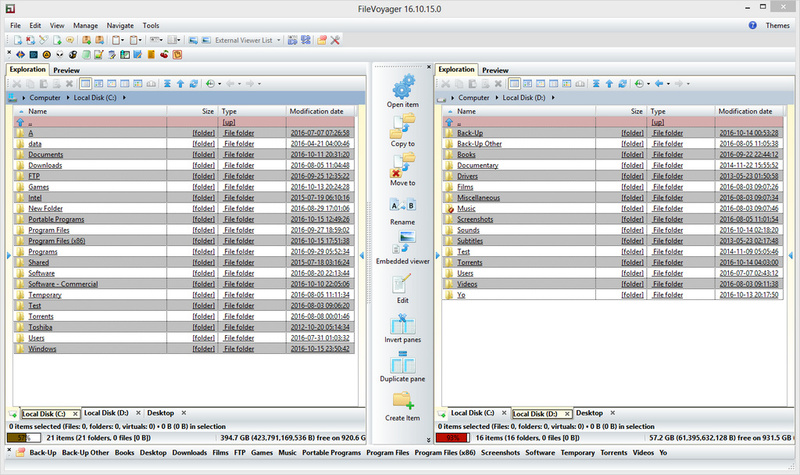 muCommander is a Java-based skinnable, tabbed file manager with a dual-pane interface. The tool connects to a many online services such as FTP, SFTP, SMB, HTTP, Amazon S3, Bonjour, HDFS (Hadoop), NFS and more. File copying includes transfer verification, rate of speed controls and transfer visualization. It can open and create a variety of archive types as well as view and modify ZIP files without recompression. The program can batch rename, change permissions/date and hash files or folders with a variety of algorithms. Cross-platform (Mac, Linux, *BSD) and available in 27 languages. Alternatively, X-muCommander is also available. How to extract: Download the "portable" tar.gz package and see forum post for further instructions. winPenPack has released X-muCommander Portable. Note: the JRE setup will be downloaded and installed automatically in the "Lib" directory. The interface uses different colors for files to distinguish file types (customizable). How to extract: Download the ZIP package and extract to a folder of your choice. Launch NexusFile.exe. Just to clarify my previous query, deleted files goes to recycle bin but the directory/folder is lost. It does not go to the recycle bin. Why it is like that and what is mklink deleted all files/folders ? I regularly have issues selecting a drive from the drop downs for each pane. On both sides the panes do nothing. It never selects a drive. My main problem with NexusFile- it is 32-bit and cannot 'see' Windows 64 shell. Can't find what you are looking for? This list shows entries with Internet - FTP Clients as a supplementary function. You can view more entries with Internet - FTP Clients as a primary function.